One year after the first leaks in the Fukushima nuclear power plant, the Japanese food crisis is not over, but the mistrust is fading away. The governement is trying to reverse the situation, after banning the products of the disaster zone: this area needs urgent support, and the authorities and industrials are ready to do everything to push it, even if it means lowering their ethical standards. Come with me to Tokyo, we’ll eat plenty of Fukushima products. Japan has to face a double problem: the Fukushima prefecture, that usually depends principally on its agriculture, is living a crisis as its products have been banned from the markets for months. Therefore it needs financial support, or even better, economic solutions that could help in the long run as the problem won’t be easy or quick to solve. The major fault is that the only thing this region has to offer is precisely those banned products, and we still don’t know how dangerous they are. The challenge is to manage to get the disaster zone back on its feet by selling its products to the rest of the country after saying that they were dangerous for months. This kind of operation can be more or less diffuclt to manage, depending on the country. In France for example, people are still highly paranoid about radioactivity after the lies of Chernobyl. They are suspicious of wind, rainfalls, food, anything that could convey contamination. In Japan, things are different. It is difficult to say exactly why the Japanese stay so calm and confident after the Fukushima incident; it is probably because of multiple factors, such as a lack of public information, a huge trust in the athorities, a patriotic reaction and most of all a cult of what’s called national relief effort. Here, industrials and politicians know that selling products from Fukushima one year after the first leaks is possible. They have two major arguments: the price and the national effort, the latter being the secret weapon that the government uses every time a very unpopular mesure needs to be accepted. For me, everything started at the hard discount supermarket. 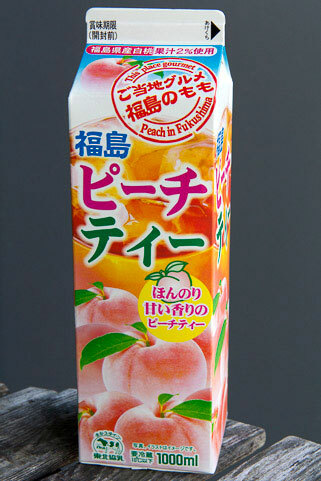 I saw an iced tea brick “Peach in Fukushima”. At the beginning, I thought to myself that it was a bad translation, or maybe that Fukushima meant something else. But I was wrong. 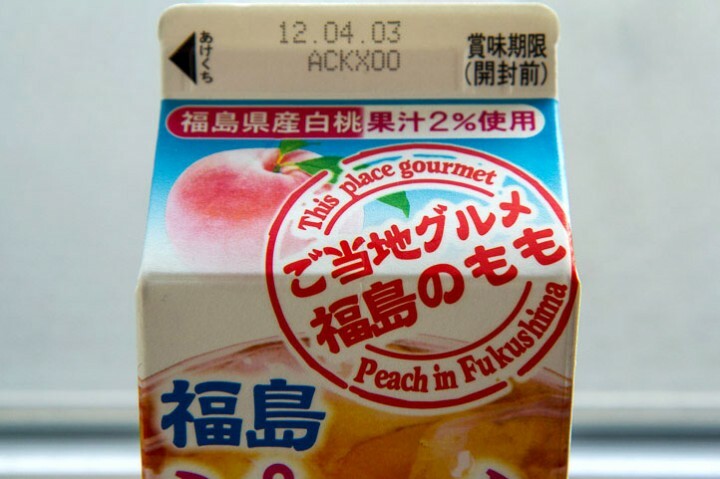 It is indeed the same Fukushima we’re talking about, and in this tea, there is 2% of peach juice, peaches from Fukushima. What strikes me is the way the marketing and packaging are done: Fukushima is highlighted as if it was a selling argument. The mention is written in big, red caracters, as if it was the best part of the product. “This place gourmet”, they say, so, if you didn’t know, Fukushima went overnight from radioactive to gourmet. I could not really understand how this sudden switch occured nor why, Fukushima products being, from my perspective, still banned or at least treated with extreme caution. So I’ve decided to look into it and find other examples of the big change that is happening. The second surprise came with fruits and vegetables, particularly green leafed vegetables that are known for stocking radioactivity. Japanese brocoli usually comes from the Fukushima region, but for the past few months, Japan has imported tons of American brocoli instead. The switch is happening: now the only brocoli you’ll find in the supermarkets is Japanese again, and of course it comes from the disaster area. It’s not expensive at all. Around 100 yens – around 1 euro – when you see the price of the other vegetables, it’s a steal. I’m not tempted to try it but here everyone’s buying it, especially the elderly. The low price is not the only reason. What’s even more important is the idea of national relief effort. Recently, the government has been urging the population to buy this brocoli and other products of the region in order to help the country and get involved a large public support movement. It may seem crazy, but it really works. Even crazier, I’ve been told a very odd story: in the Kyoto region last fall, Japanese people came from Fukushima to sell apples door to door. They were introducing their products with a little speech about their province, quite moving, explaining the difficulties it’s going through. In short, they were saying that over there, people are starving. You are touched, you want to help, ok, you’ll buy a radioactive apple. How much is it? Well it’s very expensive, even more than the apples from the supermarket that already cost 3 to 4 euros each. But it’s for a good cause, so you pay. The real question is: will you eat it? These past few weeks, one of the big issues was the question of the rice. The government started a vast campaign to get people to eat rice from Fukushima, aiming directly at a specific target: senior citizens. In November, the Guardian published an excellent article about the ban on contaminated rice, you can read it by clicking on the link. And then in March, everything suddenly changed. Reportedly some new tests got reassuring results. For one month, the government has urged to eat that rice – that was still banned 5 weeks ago – over and over, and the population and the industry are beginning to cooperate. Some simple citizens even volunteer to take over, you can read about it in this shocking article from the Japan Times in which you’ll learn that “the elderly are believed less prone to the harmful effects of radiation.” Aiming at the eldest part of the population to support Fukushima’s economy is no accident. It’s in fact very clever. In Japan, senior citizens are numerous. Therefore they are a substancial target market. Besides they are known for their acceptance and their resilience. They grew up before, during or right after the war; they’ve know the days of triumphant nationalism, violence, and they are the ones who sacrificed to rebuilt their devastated country even though they had almost nothing to eat. Japanese grandmas and granpas are warriors. They don’t fear anything and they know better than anyone what patriotism and national effort mean. They are ready to sacrifice once again to help the people of the disaster zone, and particularly youngsters, as they are the future of the nation. Top this with a total trust in the good will of their government, and you’ll get a generation that doesn’t rebel, does what it’s asked to do, and even better, gets proactive to help as much as possible. That’s not even the saddest part. The authorities are being quite cynical. They’re doing the math. If they push the elderly and not the youth to eat those products, it’s of course because the consequences won’t show as much. A way to admit that, regarding health security, we’re not sure of anything. The idea is basically that old people will die quickly anyway, so it’s not really a problem. And as they are ready to sacrifice, they will follow the orders. It’s tragic really. On the industrial side, regarding the rice from Fukushima, Japanese restaurant chains have to make a choice which is both economic and political. You have the ones that decide to play it safe and to put the accent on security, like the donburi giant Sukiya. When you only serve bowls of rice all day in more than 1000 restaurants accross Japan, the question of the origin of the products is crucial. Sukiya made the choice to display reassuring mentions in its stores, precising that the rice they served came from China at first, then Australia. With this kind of initiative, you really choose which side you’re on. You’ll gain clients, and loose some also. And politically, it’s heavy stuff: they appear as the ones who leave their country behind when they could be able to help so much. On the opposite side, there is Sabten, the tonkatsu specialist. Tonkatsu are pork cutlets and they too always come with rice. Saboten is playing a completely different card from Sukiya: they precise in their restaurants that their rice comes from the North of Japan, a policy of solidarity. Economically, it must be quite interesting as the chain gets the lowest rates possible on rice by buying this one. But the number of clients that don’t want to eat it and stop coming to Saboten must also be taken into account. In terms of image though, it is very good for the company, it’s the savior of the irradiated peasants crying for help, the big one helping the little ones, like a family, and here, people respond quite well to that kind of publicity. In short, even though we have no idea about the dangers of the products coming from Fukushima, they are sold everywhere and even pushed forward by supermarkets and restaurant chains. They are bought and eaten more and more everyday, especially by the elderly, youngsters being more suspicious and less prone to radically embrace the sacrifices needed for the national effort. The test results on those products are not made public frequently enough to regain a complete trust. It’s high time the Japanese government stopped using the solidarity argument to get real and talk honestly about health security. We’re still waiting. And hoping no food scandal will burst in the coming years. 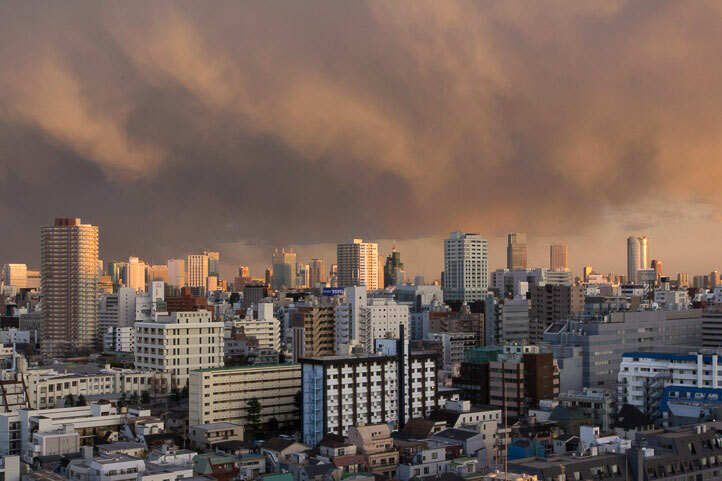 I leave you here, sharing the beautiful sunset over Tokyo we have tonight, with clouds the colour of the famous Fukushima peach. Wow, it’s always fascinating to learn about the socio-political influence of food. I’m saddened that authorities in Japan would sacrifice the health of their citizens for the revival of their economy. I think it’s counterproductive. If more citizens get sick (elderly or not), more services have to be provided, more taxes have to be spent. Right? Unless the tax system operates differently over there. The thing is that if the elderly get sick, they’ll probably cost less than youngsters because they won’t systematically reach out for help. Even if that is clearly short-term thinking from the government, this whole story shows how devoted Japanese people still are to their nation. But I’m not sure this is the best way to keep their trust. There were peaches from Fukushima and some other prefecture next to each other in the supermarket the other day, there were no label on the package, I end up buying 2 peaches for 250yem, I guess thre is a big chance they are from Fukushima, I ate one it was very sweet, I have a second thought about the one that is left, should I eat. Nobody seem to care about radioactivity here, people still think there is more risk consuming cheap fruits and vegetables from China then the ones from Fukushima prefecture. I heard in an interview that there is a radioactive waste incinerator in the middle of the peach orchard in Fukushima. If true, why would anyone eat peaches from a place where radioactive waste is being burned and the effluent could land on the peaches and on the soil where the peaches grow. Thank you for this link, it is indeed insane. But people don’t always know where the food they eat comes from… And wherever radioactive waste incinerators are put, they will always cause problems to someone: villagers, farmers, etc. If the people are not relocated, they’ll have no choice but to keep on farming on a toxic land. What’s sad is that the people are never consulted before building new nuclear plants or incinerators. There should be national referendums for these matters.